Karnataka Chief Minister HD Kumaraswamy will visit the site on Thursday. 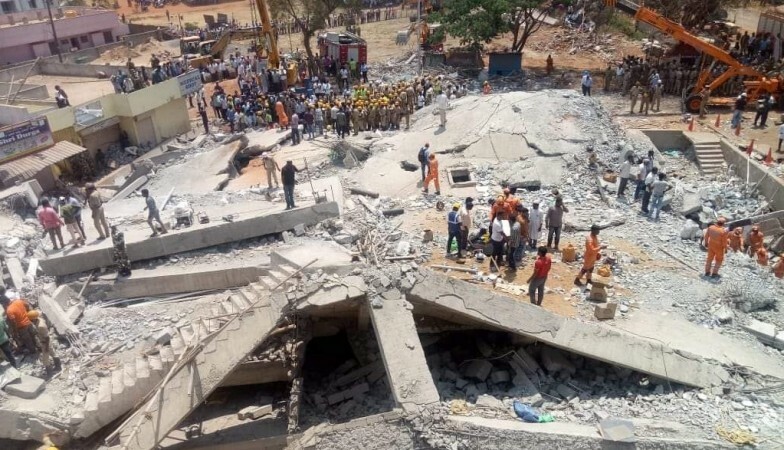 The death toll in the Dharwad building collapse in Karnataka has risen to seven with reports coming in that 12 college girls, along with several others, are still trapped under the debris even after 48 hours of the tragedy. The incident took place at Kumareshwara Nagar in the district on Tuesday and nearly 100 people were reported to be trapped in the rubbles. Now the question that arises is - with the nation facing Lok Sabha elections, is this incident being forgotten? It is felt that the issue has not been given the importance that it deserves or is being ignored by the mass despite the negligence of the contractors and local authorities. What led to the collapse? According to reports, the collapse took place due to a weak foundation of the commercial complex and the use of substandard material for the construction of the four-storied building in a 60x80 plot. The building was under construction from the past two years. The building is owned by Congress leader and former Karnataka minister Vinay Kulkarni's father-in-law Gangadhar Shintre, Mahabaleshwar Shivappa Puradagudi, Basavaraj Demappa Nigadi and Ravi Basavaraj Sabarad. The first and second floor of the building was already rented out. Police have filed an FIR under section 304 of Indian Penal Code (IPC) against the building owners. The local police and fire personnel had initiated the rescue operations. On Wednesday, another team of 110 National Disaster Response Force (NDRF) officers from Ghaziabad were deployed to Dharwad and did the rescue operations along with 45 Bengaluru NDRF personnel. The rescue operations are being jointly conducted by NDRF and State Disaster Relief Response (SDRF). A total of 54 people have been rescued and seven bodies have been retrieved. The deceased are identified as Ashit Hiremath (28) from Dharwad, his father Mahesh Hiremath (62), Shivashakti Colony, Hubballi, Salim Makandar (35) of Hubballi, Maboobsab Raichur (48), Mehboobsab Desai (55) of Hubballi and Aslam Sheikh (50). The officials received information from Prakash Kudatarkar who runs a cyber café in the building that 12 girls from the north Karnataka region and his son Anup were feared trapped under the rubble, reported Deccan Herald. Officials also said that during the rescue operations, they could hear some girls calling out for help. Due to the thick concrete slabs that had fallen on the girls, it took the team nearly five hours to gain access to the girls from under the debris after clearing the slabs. The rescuers had provided the girls with water and glucose in the morning through an opening, but the tension heightened as time went by as they could no longer hear any voices from the trapped girls. The Karnataka Chief Minister HD Kumaraswamy tweeted about the tragedy and the rescue operations, "The rescue work at Dharwad building collapse site is on. I spoke to the Revenue Minister who is on site and the DC and took stock of the progress in rescue operations. I have told the Chief Secretary to make a detailed inquiry into the accident," he said. He will visit the spot on Thursday. 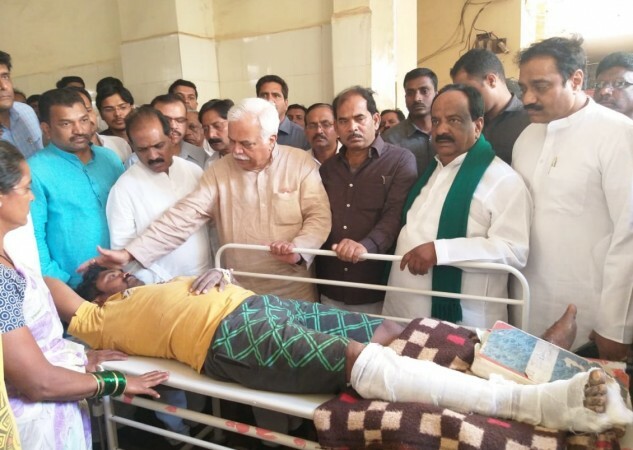 Karnataka Revenue Minister RV Deshpande said that an enquiry will be conducted over the incident and stern action will be taken against the guilty. Those injured will be treated free of cost.